To celebrate its 150th Anniversary and demonstrate an ongoing commitment to design and innovation, international watch brand Timex collaborated with Core77 to carry out a global design competition: Timex2154: THE FUTURE OF TIME that could highlight the state-of-the-art timekeeping pioneered by the company. One of the runners up at the competition, the TX54 concept presents a disposable timepiece that can be worn on the user’s thumbnail making it an invaluable fashion accessory as well. 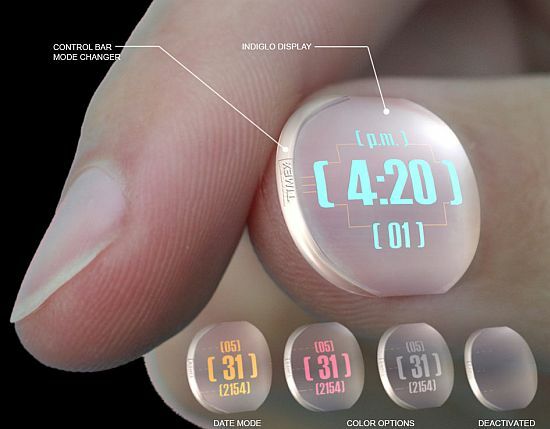 Thanks to a translucent body, the design blends seamlessly with the nail while a selection of text color options and a glow feature activating on command make it supremely functional as well. A perfect blend of appearance, user interface, and technology, the nail watch passes most standards of modern design with flying colors thanks to its functional and minimalist appeal.